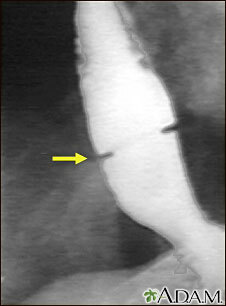 A solution containing a dye (barium), which is visible on x-rays, has been swallowed (upper GI series) and x-rays have been taken of the esophagus. There is a narrowing near the stomach (indicated by the arrow). This non-cancerous ring of tissue (Shatzki ring) may cause swallowing problems (dysphagia) and can be treated with dilation of the stricture.